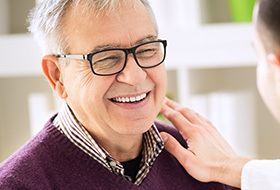 Dentures are used to replace missing teeth for patients with no remaining teeth (complete dentures) or used to replace several missing teeth (partial dentures). Dentures will improve your smile and facial appearance. Often patients take their teeth for granted. They don’t realize the difficulties with speech, eating, and social interactions that may arise after teeth have been extracted. Ideally, patients should do all they can to keep their natural teeth because when a patient is left without teeth, they have very few options. The first is to remain edentulous (no teeth), while another is to have full dental implants placed. You can also have a denture made or a combination of the denture and implants. The most affordable option to replace missing teeth is dentures. What are the Benefits of Dentures in Pittsburgh? The patient is able to chew. Speech is better when teeth are present to help with certain sounds (“s,” “f,” etc). Improved confidence in social interactions. The denture can be designed to “fill” facial features and reduce sunken skin. What are the Disadvantages of Dentures in Pittsburgh? They can feel very bulky. Patients often have insecurity with “artificial” teeth. There can be difficulty chewing and speaking without denture movement. Bone loss will occur that is irreversible. Traditional dentures – This option is the most economical but does have some issues with staying in place. Standard implant stabilization –We will use 2-4 large diameter implants. Full implant loaded crowns – This option is permanent and non-reversible. Why Would Someone Need to Get Dentures? Over time, a patient’s teeth have gradually been extracted due to injury or advanced decay. The majority of remaining teeth are broken and not restorable; alternatively, finances are limited. Severe, untreated periodontal disease has rendered the teeth unviable.